The main topic of the book is the nature of inner aspect of the Verb Phrase, and the relation between the decompositional and the quantificational approaches to this problem. Decompositional approaches analyze eventualities into simpler components, organized by some kind of structure. In this view, an eventuality is telic if, in decomposition, it can be shown to involve a result component (also referred to as the culmination or termination component, or as the telos). Quantificational approaches see telicity as a property of the predicate of an eventuality, usually described as boundedness, lack of the subinterval property, or a specified quantity. 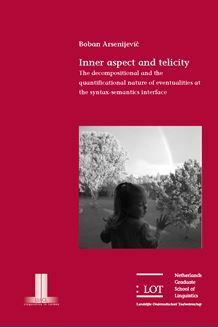 The major advantage of the decompositional approaches is that they directly match the syntax­semantics interface of the VP with the conceptual image of an eventuality. Quantificational approaches blur the picture in this respect, because they involve effects like distributive readings, which are not a typical interpretational component of the VP domain. On the other hand, the major advantage of the quantificational approaches is that they assign similar or identical properties to (the predicates of) eventualities and nominal expressions. This enables them to capture the phenomenon of incremental themes (participants that appear to measure out the eventuality in which they take part), by relating the predicates of eventualities and those of their arguments. The dissertation presents a new approach, which not only combines the two approaches above, but also shows how they are directly mutually related, and how some quantificational properties can be derived from the domain of decomposition.